If you use Flickr, Smugmug, or Facebook there are many ways to post photos and videos to your account. You can do it right through the websites of the company, you can get plug-ins for iPhoto, you can use iOS apps, or you can use an app like Poster. Poster, by Reinvented Software, is made to upload content to your account of one of the three mentioned services. How does it work? Read on. When you open Poster you are greated with a screen prompted you to add content (photos or video). You add content by dragging and dropping files onto the screen or you click the “+” button and load them through the typical load window from where they are on your computer. If you are using iPhoto you are going to want to load by dragging and dropping from iPhoto. Unfortunately, there is no direct iPhoto integration (this would be a big plus), so you have to rearrange your windows for dragging and dropping. 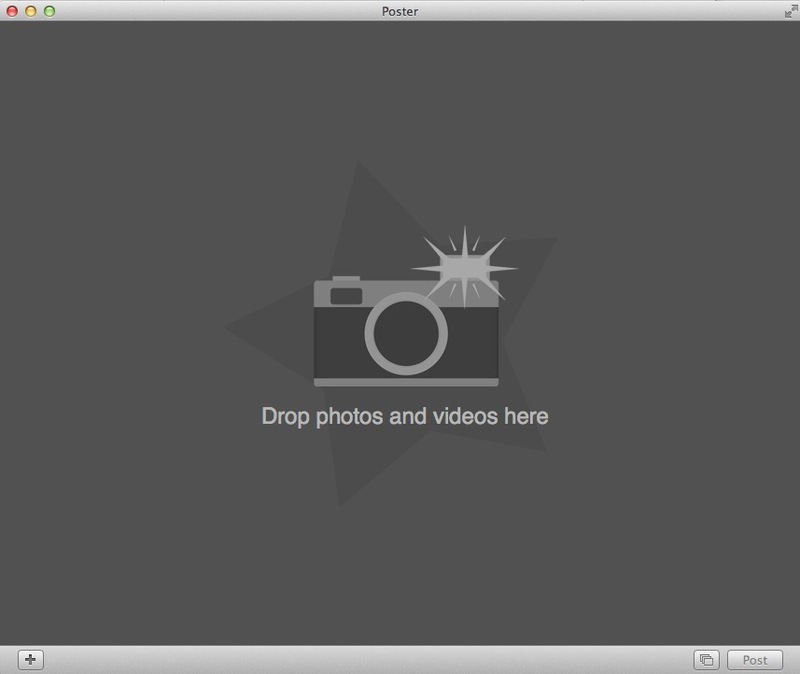 There is an iPhoto plug-in which is available from the Reinvented Software site. However, while it worked great for photos it could not transfer videos from within iPhoto. I also noticed that videos will take an extended period to get into Poster. A fifty second video took several minutes to load (of course, a faster machine might be faster at this). Once your photos are added the screen changes to your default service account. If you do not have a default set you are prompted to pick the service you want to load to. Here you can set galleries, keywords, and other settings provided by the service. 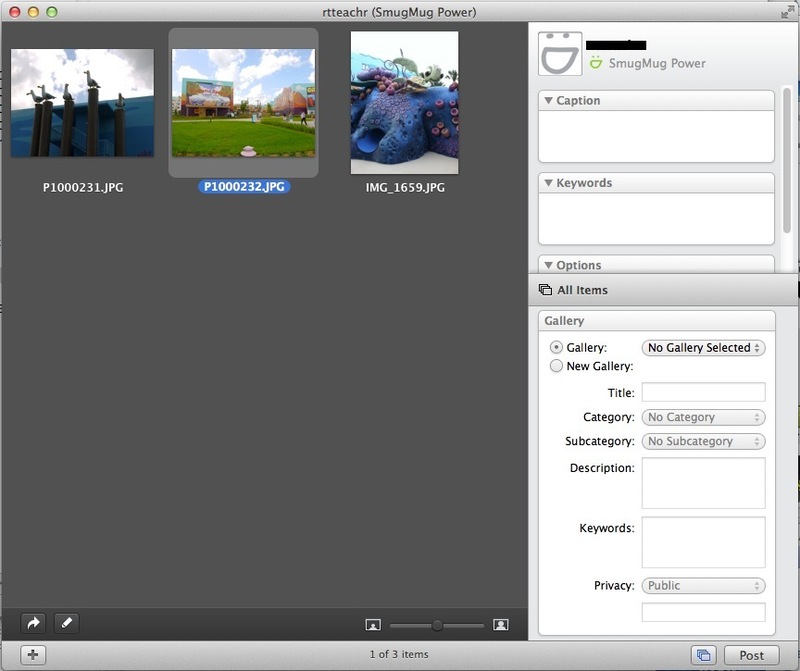 For Smugmug you can also choose to password protect your pictures or make them public (for example). Once you have everything set you click post and the content uploads to your account. One thing I did not like is that if you have a default account set you cannot switch between accounts of different services. You have to not set a default account and choose the account each time to move between accounts. Another related annoyance is that there is an accounts setting in the preferences. Here you can delete accounts, but you cannot add them. You have to add them from the screen used to choose your account. Not a show stopper, but it feels like that is missing. One nice touch is the ability to rotate photos before uploading in the event the import wrong. After you upload your files, Poster can send you straight to your account to check out the new files. I don’t have a Facebook or Flickr account, but I do have a Smugmug account and I will say it works great. It makes it very easy to upload to the site without having to do everything directly through the website. With iPhoto plugins available for many of these services you might ask why you would need an app like Poster. Well, you might not use iPhoto, and/or you might have pictures and videos scattered throughout your computer. Poster is a nice way to collect everything together for a one shot upload in one place. It isn’t perfect, and it would also be nice to see other services supported (ie. Posterous, or Shutterfly, etc). However, it does what it says it will do and if you hate uploading through website interfaces like I do, this is worthing trying out.